You pick up the deck of cards, shuffle it and draw a single card from the deck. 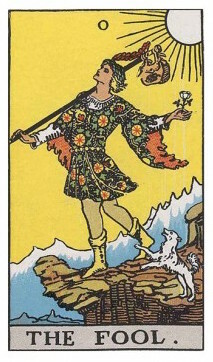 This card is one of the Major Arcana – Key O – The Fool. You find a comfortable space in your Hall and sit on one of the chairs placed against the wall. Breathe deeply and fully. Relax your gaze and simply sit with the card. Open your mind to whatever impressions of what you are seeing choose to present. The colors, the characters, the scenery… everything. Take as much time as you need. ” The Fool is either the most dimwitted of mortals or is the very essence of absolute release and trust in the Universe. There is no obvious fear nor worry in the fact that he is at the very edge of a cliff and even the nipping at his heels of the dog, does nothing to disturb his picturesque “posing”. I suppose the question to ask would be how he came to be in this place, what drove him to the “ends of the earth” and will he blindly continue moving forward falling to certain death. As you think on these words, your own impressions begin to bubble up and interweave creating a deeper and more connected source of interpretation. You look at the page and see that as you think through your impressions, each is written into the book, filling the page and by no seen hand or pen. Your thoughts are literally transferring to this volume and your impressions are creating new paragraphs of understanding. When you have finished, you pick up the book, read through all that is now written about this first Tarot Key of the Major Arcana. You smile, satisfied and very happy with the progress you have made. These thoughts and feelings move through you as the table, cards and book begin to fade and you find yourself once again in the dimly Hall, seemingly empty of furnishings. You look around, knowing that visual seeing is not the only way of knowing, and so this is also true of your Hall of Divination. You walk towards the door, gently push it open and return once again to your Temple of the Wise. This entry was posted in CofMagick-Lesson Three, Hall of Divination. Bookmark the permalink.